Yep, I'm wearing this dress right now. It's the same pattern (Vogue 9760) once more — in fact, I made this one BEFORE I made the last two ones that I showed you. Which is why the print doesn't match as well. I really like the orange facing. It's probably what makes me happiest about this dress. Aside from the fact that it's Liberty fabric, of course. 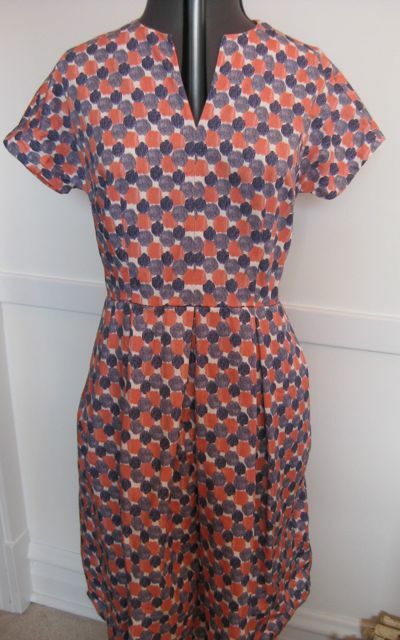 I forget what the name of this Liberty pattern is, but it shows up on ebay.co.uk pretty often, if you are now struck by a boundless yearning for it, just keep an eye out. I really need to find a copy of this pattern…of course, I’ve been denied the Duro, Jr., until I find it eBay, too! Very nice! I love the print and the colors. Props to you for doing that lovely hem by hand instead of justifying a machine top stitched hem with the old ‘the pattern will hide the thread’ line. Love the dress, LOVE the cloth! That’s ok–the more the merrier! This is one cool, breezy dress…guaranteed to whisk any blues away. (And speaking of blue, it would look perfect with all-navy-blue accessories…but maybe that’s too obvious a choice.) 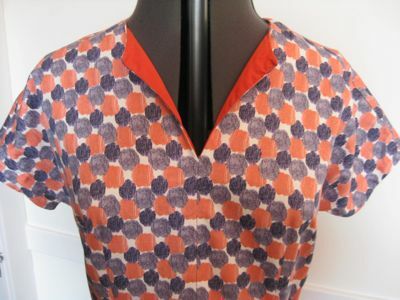 I love the way the orange printed squares down the bodice look like Trompe l’Oeil buttons! You may have answered this in the past but why do you use hem tape? Is it a personal preference or does it have an impact on the final product? I love the contrast facing! If it were my dress, I might even tack the lapels down so it would show (your photos with the facing showing are especially pretty!) … and maybe even run some piping in the same color down the front seam. I like the orange facing! This dress is so colorful I like it but it must have pockets. Oh boy Cookie – you’re asking me to talk about sewing stuff. Are you sure you’re up for this? ;)I have 3 ways of doing hems right now, depending on how I want the final result.Hem 1 – Not seen. I make undergarments and in those cases I’ll just do a rolled hem on the serger. It’s durable and fast.Hem 2 – Seen but not important. I’ll serge the raw edge, turn the hem, and stitch in place. 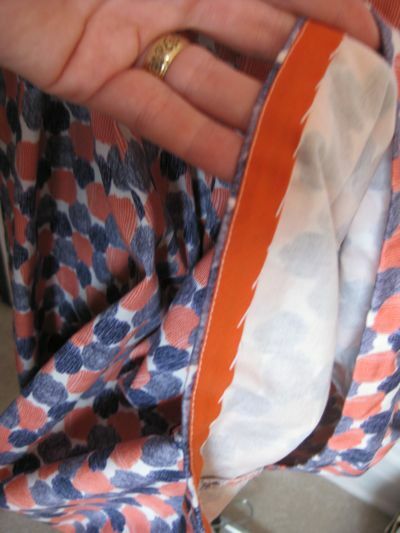 Mostly that’s done by hand but again, if it isn’t that special I will machine hem.Hem 3 – Seen but kind of important. In these I’ll turn the hem and press, then turn the raw edges in and hand hem it into a neat edge.I was wondering about the hem tape because I didn’t know if the weight of a double turned hem had an impact on the hang of the skirt or if her preference is to use hem tape to cover the raw edges.In some cases hem tape can add a stiffening to the hem (horsehair braid, satin ribbon) and that’s going to hang differently than the other ways of doing hems.I don’t personally use hem tape so I’m looking to see if there’s an advantage to doing so and how I can use it in my next projects. FASCINATING! I’m sure we’re all eagerly awaiting Miss Erin’s counter-defense argument for her precious hem tape. Thanks for sharing your methods. And keep in mind, people, that if you make every single garment out of tulle, all you have to do is trim the edges neatly….you don’t even need pinking sheers! This is the tip I am contributing to the discussion. That reminds me, I still have to learn how to use the blindhem on my new machine.I found a cut-out-but-not-assembled vintage dress at a thrift store the other day (long story there) and one of the notions included was some stretchy lace tape stuff. Is that meant to be used for the hem, or what? Joni – since I’ve learned to use the blind hem stitch – ILOVEIT. I can’t hand sew because of carpal tunnel, so it’s a reall beenfit to me. Where the heck is Erin?I am impatient for a new dress. I hope she is ok.
Erin, will we ever see the dresses on you? They seem lifeless on the dress form and I’d love to see them paired with one of your famous cardigans!